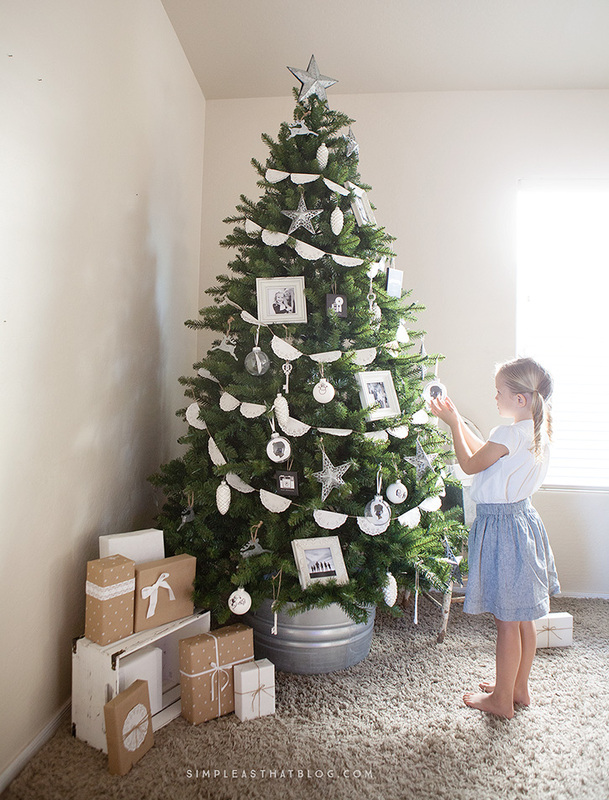 Simple Rustic Christmas Memory Tree – the Christmas season is a magical time that’s all about making family memories. 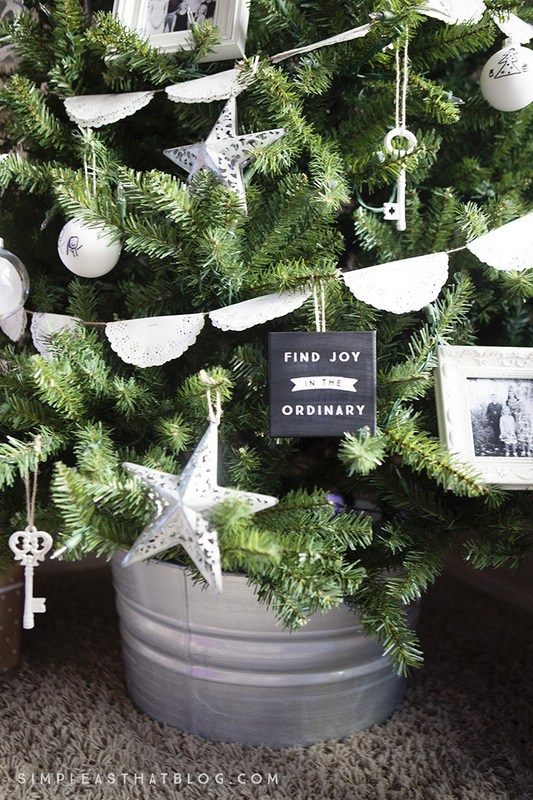 This simple, rustic tree celebrates those special moments from Christmas and throughout the year. It’s time for the annual Michael’s Dream Tree challenge and I’m so excited to participate for the first time this year. 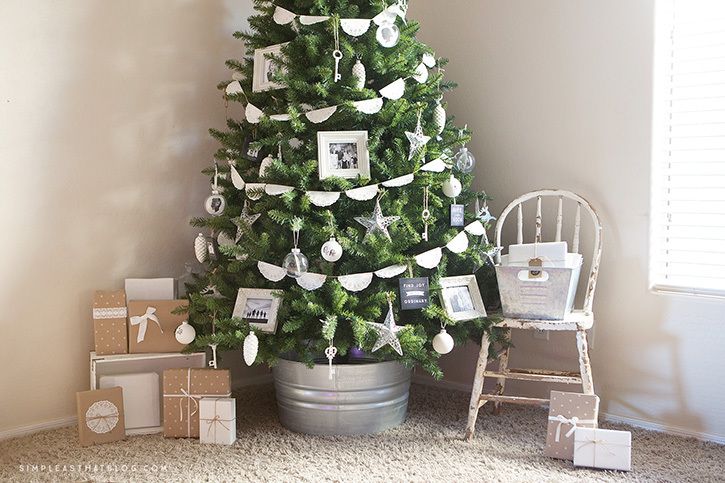 We’re keeping things simple this Christmas and what better place to start than with the tree! On the Simple as That Facebook page a few weeks ago I mentioned that I was struggling with the thought of buying gifts this year. 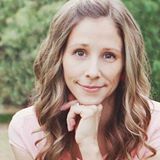 I feel like our family just doesn’t need anymore stuff and we’ve been contemplating forgoing gifts and planning a family trip instead. 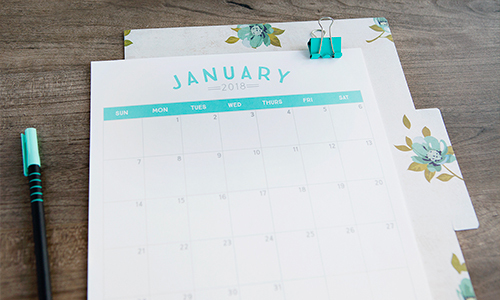 We feel strongly that we’d much rather invest our time and money into making family memories vs. buying things this year. I wanted to decorate this tree to reflect our intention of focusing on making memories and spending time, not money this holiday season. Here’s a photo of the tree all lit up at night. Taking photos of a lit Christmas tree in low light can be tricky, but if you’re determined to get a beautiful shot of the tree this year, here are some quick tips. 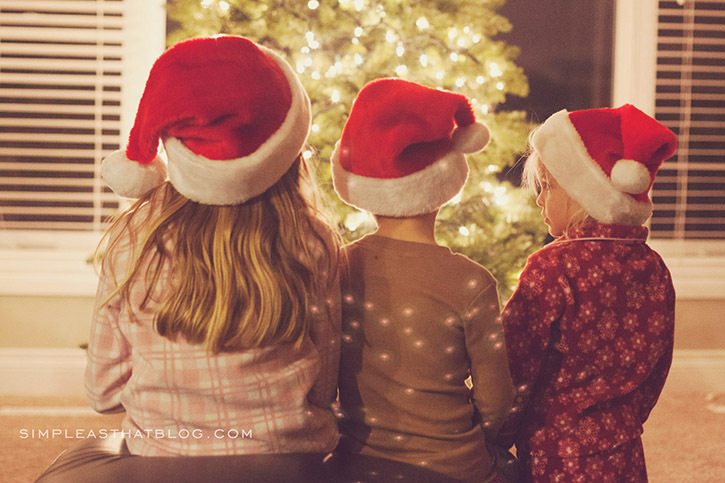 Christmas doesn’t need to be about fancy wrapped packages, elaborate meals or expensive gifts – it’s about the special memories we make as a family. With some simple, handmade ornaments this tree came together inexpensively and was a labor of love involving the entire family. As a photographer, decorating with photos is one of my favorite things to do. 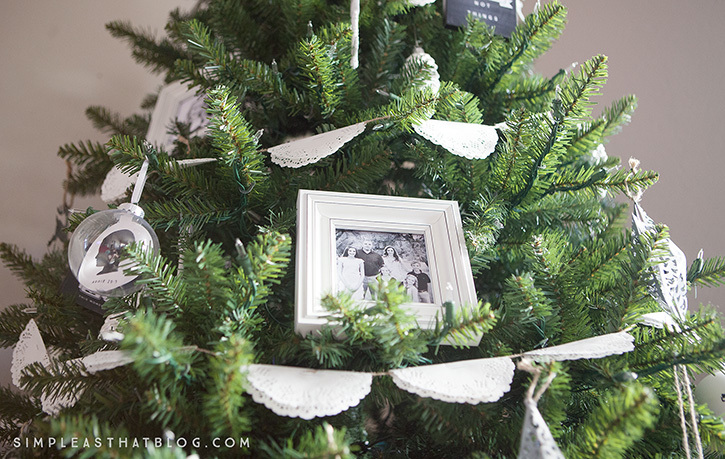 Incorporating some photo frames in the tree was such a fun way to showcase some of our favorite family memories from the past year. It will be fun to switch out the photos from year to year. 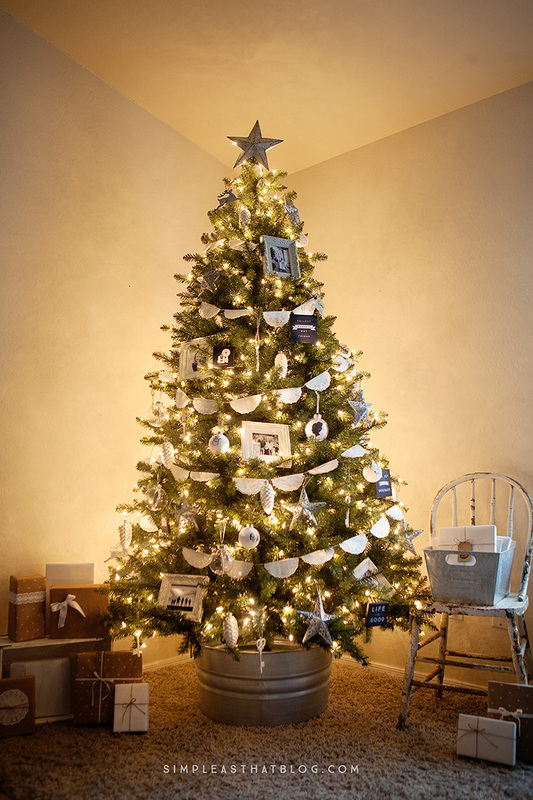 I love the personalized, sentimental touch the photos add to the tree. Inexpensive tin ornaments, paper doilies and some old fashioned keys that I found in the dollar aisle (all at Michaels) compliment the photo frames perfectly. 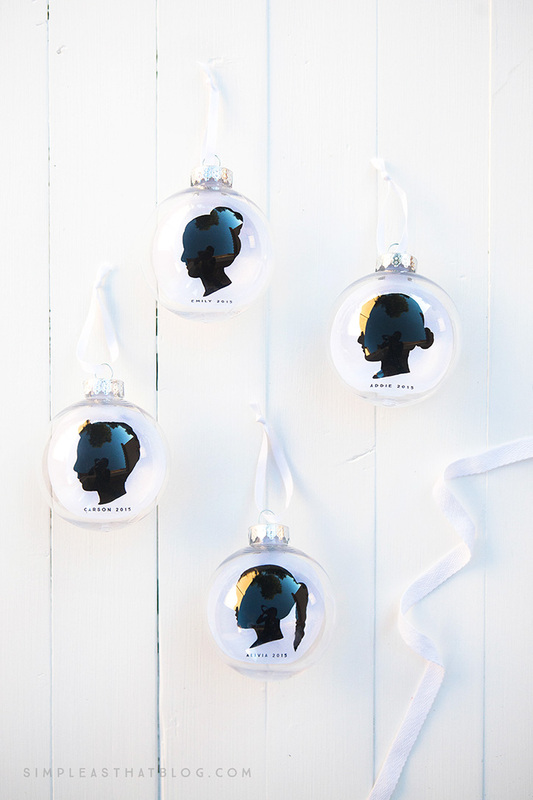 I think these silhouette ornaments I made of the kids are my most favorite things on the tree and I’ll be sharing how you can DIY these simple ornaments in an upcoming post. Aren’t they pretty? I can see a new tradition of making these ornaments each year just beginning! I love how they turned out. I also created these mini, faux canvas print ornaments. They were so easy to put together! 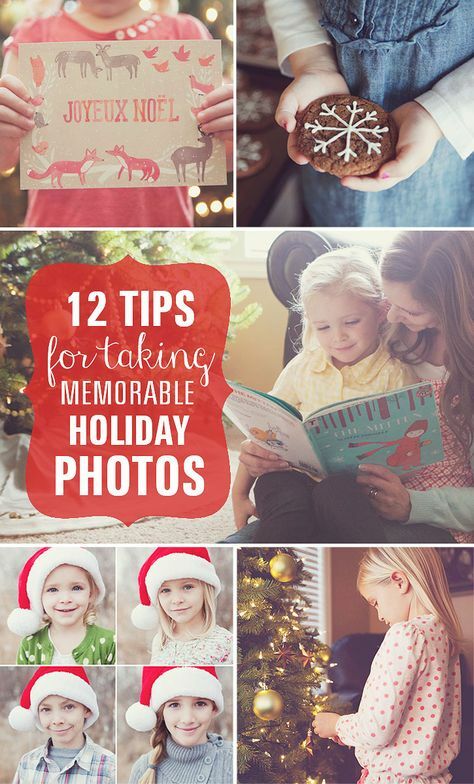 Watch for a post with the quick how-to and the free printables to make your own coming soon. 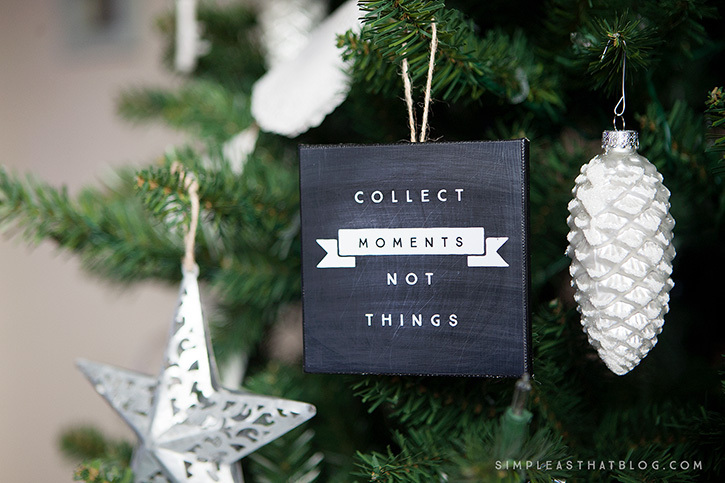 Our family picks a theme to follow each new year and the quote we’ll be focusing on in 2016 is “Collect Moments, not things.” It was with this quote in mind that I created all the elements for our memory tree. 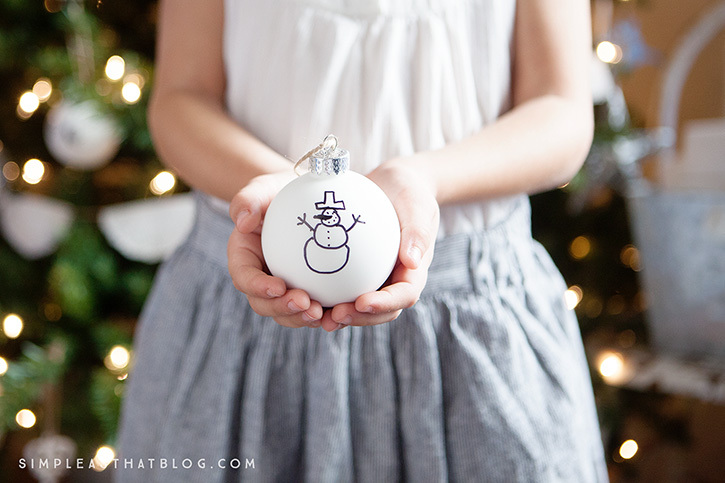 These ornaments were so fun for the kids and you really can’t get much simpler than drawing on white bulb ornaments with sharpies. The result isn’t anything fancy, but they’re so personal and precious! I love my kids artwork and I smile every time I see these hanging on the tree. Add their name and date on the back and you have a darling Christmas keepsake. I couldn’t finish telling you about our tree without mentioning the Christmas book countdown we do every year. 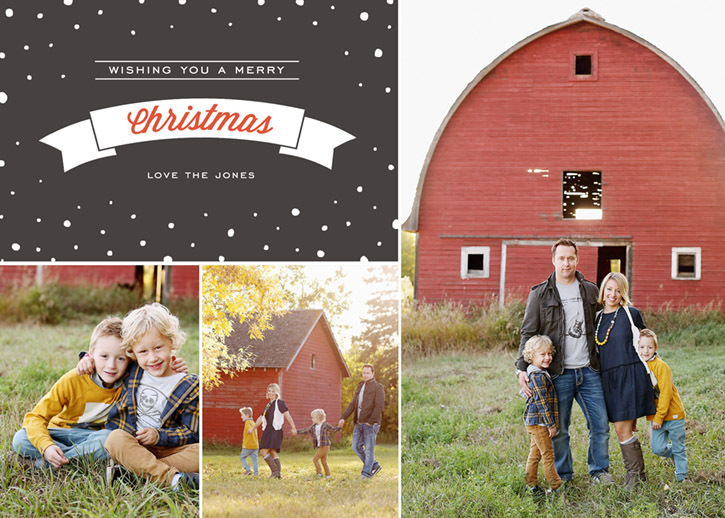 It’s such a special tradition in our family – one my kids look forward to every year. You can read more about it here, but in a nutshell, we wrap up 25 Christmas books and beginning the first of December we open one per day and read them together as we countdown to Christmas. We keep our books out in a bin or basket beside the tree for the entire month of December. 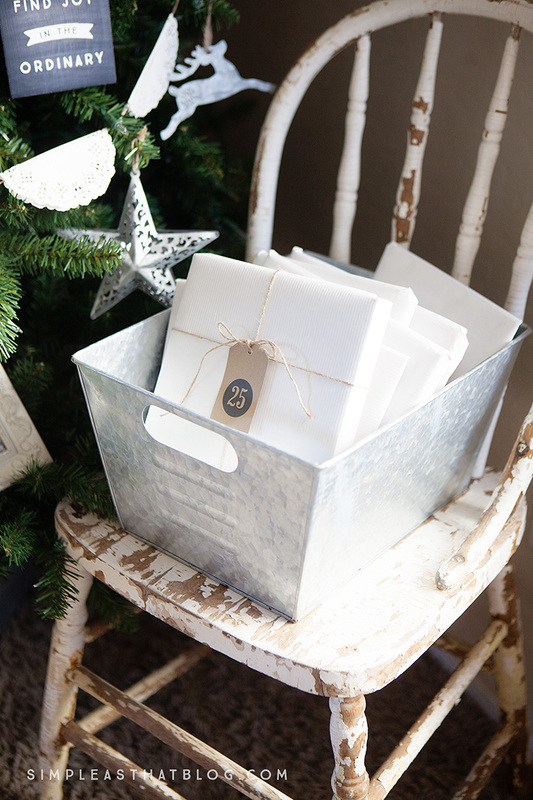 This year I put them in this metal container I found at Michaels and added an old chair beside the tree as a special place for our treasured Christmas books. I have some simple countdown tags that are perfect for wrapping books for this book countdown and you can download them here for free. **Hint: When the hustle and bustle has died down and before you pack them away, wrap all your books so they’ll be ready when you pull them out the next year! That’s it for now. 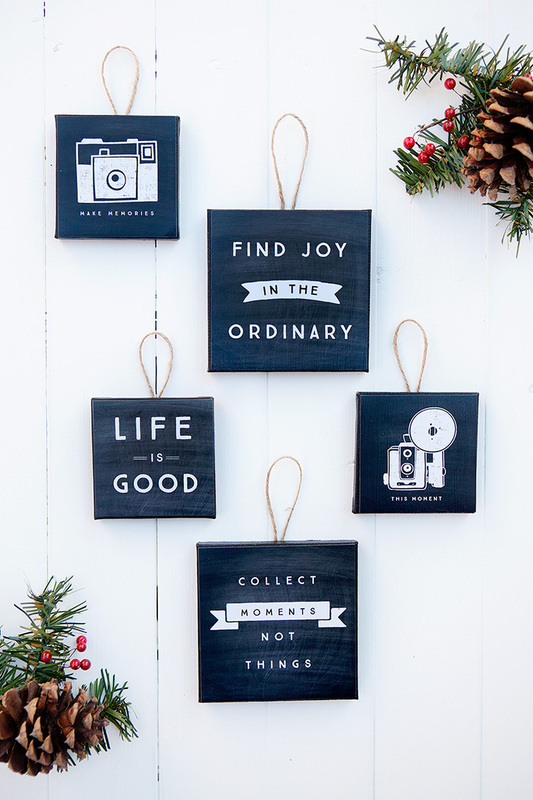 Again, I’ll be sharing how-to’s on all the ornaments in the coming weeks so stop back by for those and give me a follow on Instagram, Facebook and Pinterest for more simple, meaningful Christmas inspiration this holiday season. 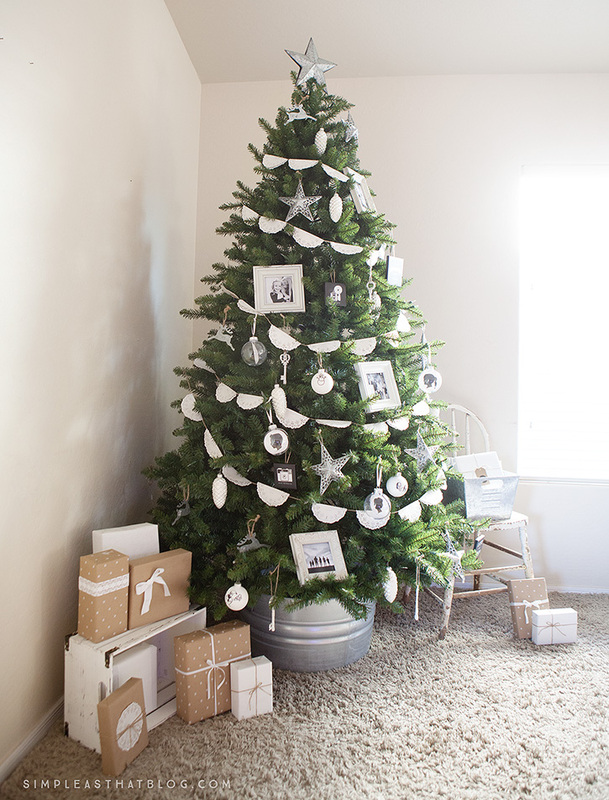 From now until November 14, you can get FREE shippingon all Christmas trees that are 6ft or taller on Michaels.com! I adore this Christmas tree! I love the simplicity and rustic charm of it . 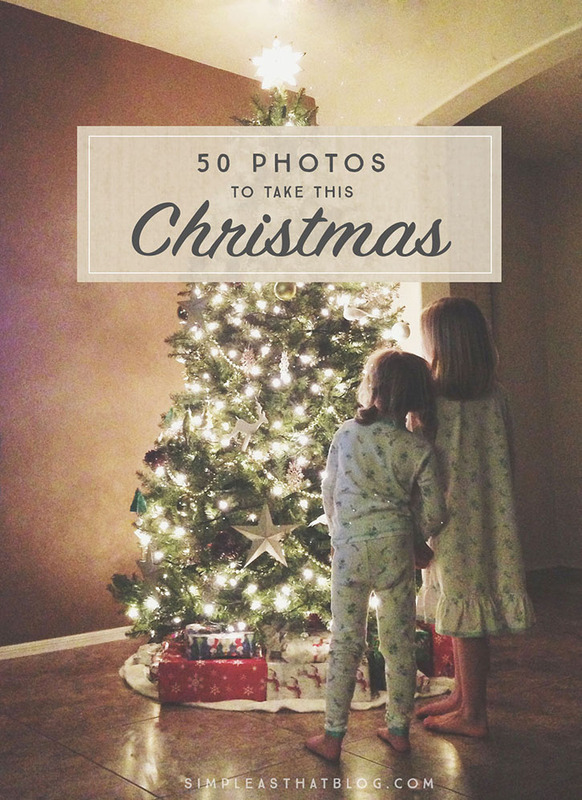 Your tree is beautiful and a great idea to use family photos. 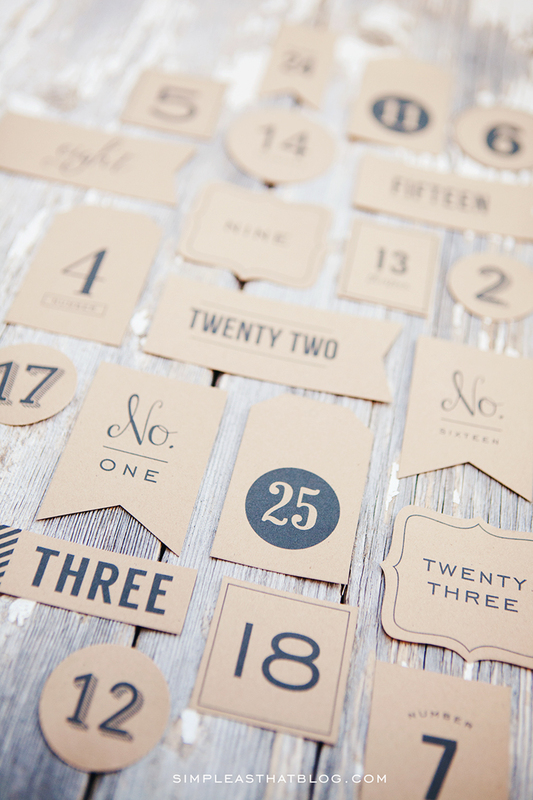 Love this and makes me so excited to simplify Christmas. Can you tell me where you got your bucket to hold your tree?? Simplicity helps put the focus on the real meaning of Christmas! LOVE your style! 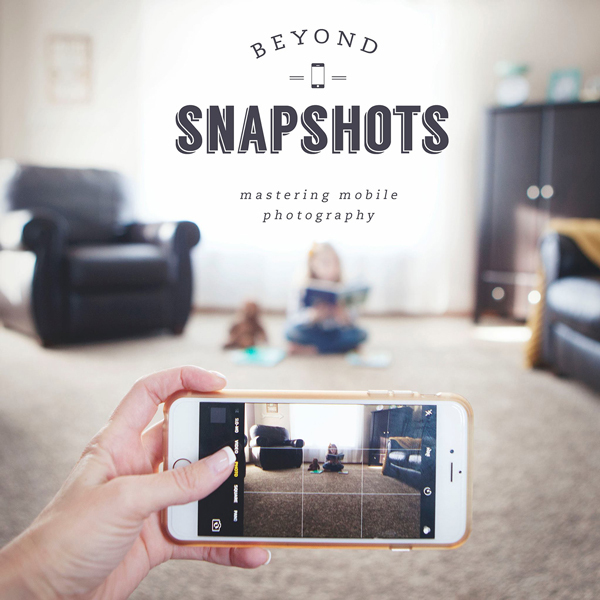 LOVE how perfectly simple it is…and that you got your kids involved. SERIOUSLY perfect! 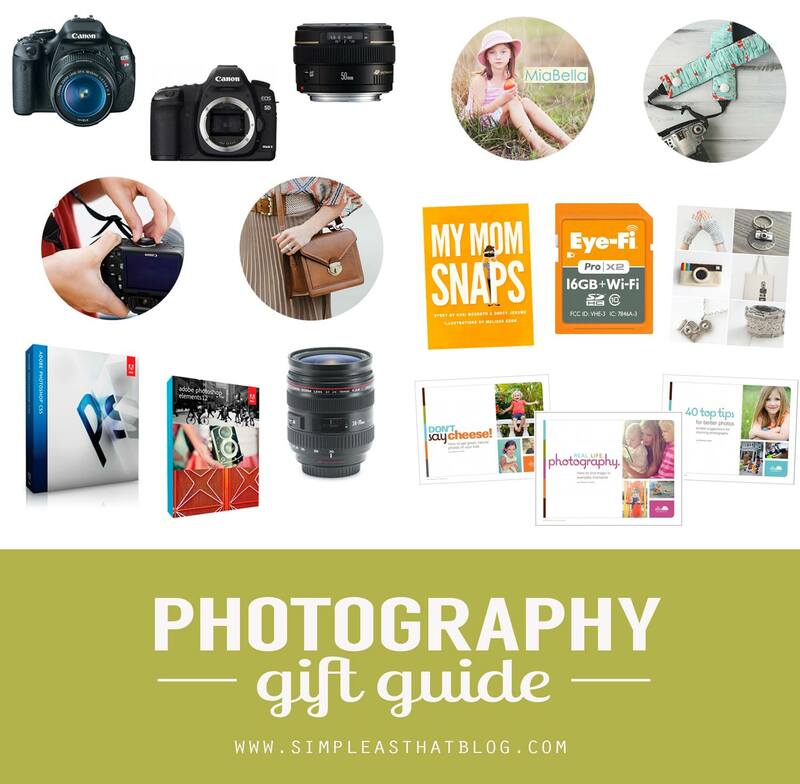 I love that you guys focus on building memories more than building a big collection of gifts! And your tree is so warm and beautiful – just lovely! I had the hardest time photographing mine in our little one-bredroom apartment! Love your tree! I love having frames and memories on my tree too! 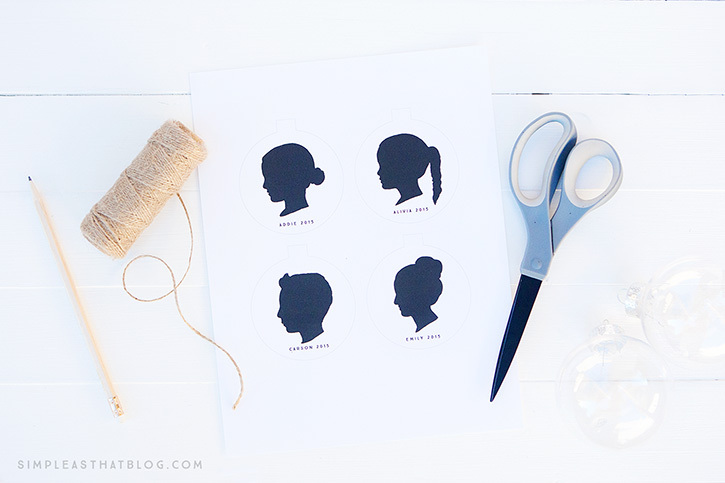 Can’t wait to make some silhouette ornaments this year! Thanks for sharing! Beautiful tree ideas! I love the silhouettes and canvases! Love love love it Rebecca!!! It totally suits you too 🙂 Great job! Thanks for sharing all of the beautiful ideas. You have mastered the art of Christmas decor beautifully. Your tree is beautiful and timeless! 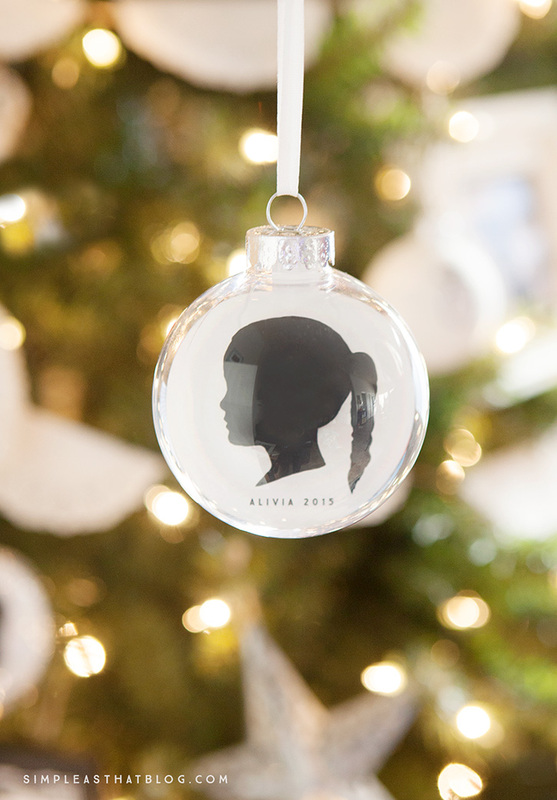 The silhouette ornaments are such a sweet and personal touch too! Your tree is exquisite! The colors, the design and the attention to detail make it a really warm and happy project! Thanks for sharing! Rebecca, what a simply beautiful tree and what wonderful memories you’ll create with your travels. 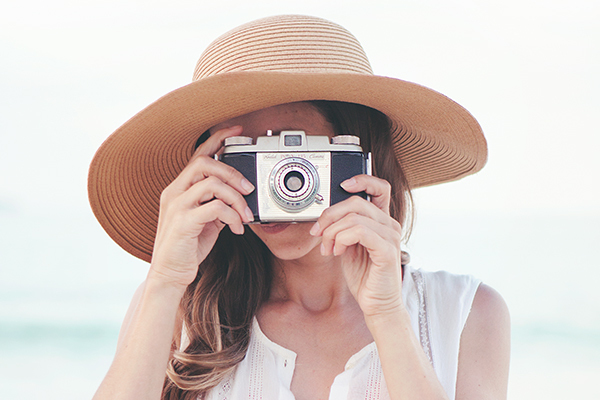 We struggle with the fact that our family doesn’t need anything either and often do opt for a trip as we all do love to travel. Your site is really very attractive. Enjoying the eye candy.